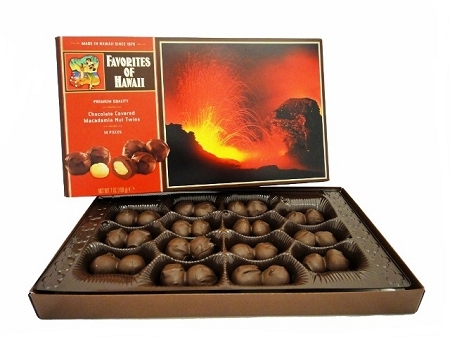 Made in Hawaii with 100% Hawaiian grown macadamia nuts. This newest item, Macadamia Nut Twins, enrobes two macadamia nuts, joining them together in rich milk chocolate. The scenic shot is from a volcano eruption at the Kilauea crater on the Big Island of Hawaii.